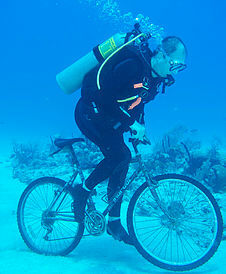 ​My interest in diving comes from TV shows like Seahunt and Flipper and then later from Jacques Cousteau. I breathed through a regulator for the first time when I was thirteen in a swimming pool and thought it was truly the coolest thing I'd ever done. It seemed so easy that I thought I must be doing it wrong. 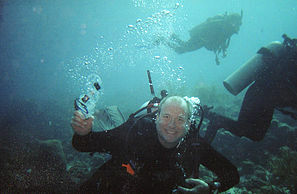 When I was a young adult a friend and I enrolled in a NAUI certification course. My friend dropped out because of some of the stringent requirements and I completed without him. I love watching sports and hardly miss any Warriors or Giants games, playing basketball or just shooting hoops are one of my favorite things. I dabble in art and poetry. I got started diving in the early eighties and am the only one in my family who dives. I am kind of a natural teacher so being a Dive Con seems like a natural thing to do. One of my favorite sights is when I see former students arriving and doing a dive without a teacher. The bird has left the nest.